From the back cover: Among the most published of popular musicians. 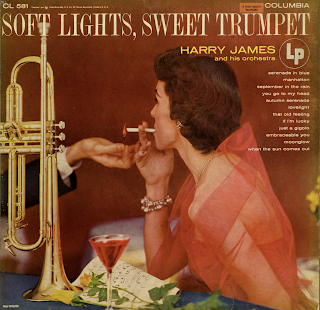 Harry James has virtually lived with popular music all his life. Arriving on the commercial scene just too late for first-hand absorption from the great jazz masters, he worked with most of the swing greats, who had already culled the best of the jazz techniques and adapted them to their own styles. James' first important job in popular music was with Benny Goodman and his orchestra in the late thirties, where he brought to its peak the shining trumpet mastery that is his trademark. Learning from the brilliant musicians of the Goodman orchestra, and supplementing their work with his own fresh ideas and expert technique, he swiftly became one of the top-ranking stars in an orchestra of stars. That he was already a musician upon joining the group is no accident: he was born into music, for his father was bandmaster with the Mighty Haag Circus. The rousing brass of the circus band was part of his daily routine, and he worked with the band frequently during his early years, until the family retired to Texas. There, in Beaumont, he continued to study, and in his 'teens he played with local orchestras and supplied them with an occasional original number. One of these numbers got recorded, Benny Goodman heard its and sent from the young composer. After a number of fruitful years with Goodman, James started his own orchestra, and found the going at first a little difficult. The swing era like everything else at the time, was going into a recession, and he found, with the changing mood of the country, that audiences wanted to dance rather than listen; the clusters of avid youngsters around the bandstand grew smaller. So he brought out the smooth, warm ballad techniques that is so uniquely his, and, with a group of hit records, found himself the leader of one of the most successful orchestras in the land. The formula was not only commercial – his group is one of the very few big orchestra still in existence – but musical, and it produced music that is still listened to on records and still very much a part of the popular scene. From Billboard - July 26, 1952 (10 inch release, Columbia CL 6207): New collection of evergreens played by Harry James Ork freatures the skillful trumpet man playing sweet music on the horn, music that is danceable as well as listenable. The tunes include "Embraceable You," " Manhattan," "Just A Gigolo," "You Go To My Head" and other favorites. James does a lovely job with his solos, which are clear and sweet and stress the smooth James tone. The arrangements are tasteful and the work plays them well. This set will probably form a companion piece to the recently issued Columbia LP "Benny Goodman With Strings," since both are in the sweet, danceable vein. James' fans should go for this one.